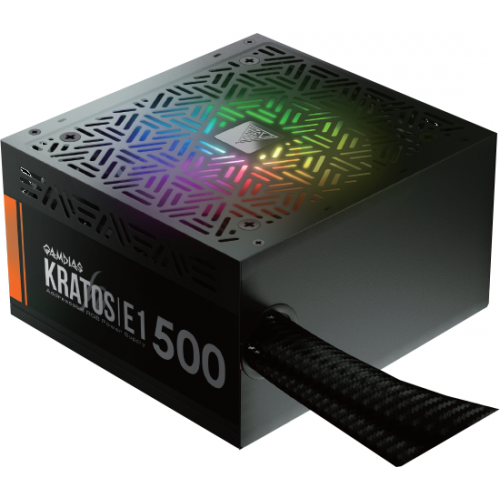 Gamdias KRATOS E1-500 500 Watt RGB Power Supply With 80 PLUS® certified up to 80% Efficiency . Deliver upto 80% efficiency at 230V. Built in RGB Lighting Effects. Customizable RGB lighting via MB manufacture sync software. High performance and stable power supply. Automatic fan speed optimizing according to temperature. Support Intel C6/C7 power state. Circuit Shield: OVP, UVP, OPP, SCP. This RGB Power Supply provides 2 years of warranty facility.